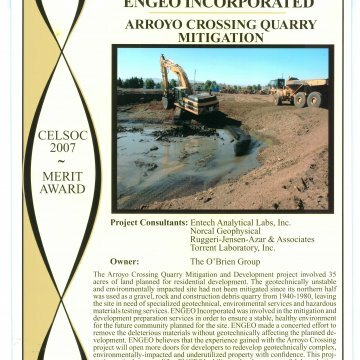 ENGEO Incorporated has been selected to receive a Merit Award in CELSOC’s 2007 Engineering Excellence Award competition for the Arroyo Crossings Quarry Mitigation and Development Project in Livermore, California. This project was recognized because of their ability to provide quality services in the fields of geotechnical and environmental engineering and the use of innovative, cost-saving solutions. Shawn Munger, Joe Tootle, Patrick Lam, and Brian Johnson brought this project to completion. The Arroyo Crossing Quarry Mitigation and Development project involved 35 acres of land planned for residential development. The geotechnically unstable and environmentally-impacted site had not been mitigated since its northern half was used as a gravel, rock and construction debris quarry from 1940-1980, leaving the site in need of specialized geotechnical, environmental services and hazardous materials testing services. ENGEO developed mitigation techniques that were effective and sustainable while maintaining a positive presence within the surrounding densely-populated community. ENGEO made a concerted effort to remove as much deleterious materials as possible without geotechnically affecting the planned development. They innovatively pinpointed contaminated soil and materials for disposal, maximizing the volume of recycled crushed concrete and clean-tested soil for reuse on site as engineered fill. As pristine land within developed areas becomes scarce, ENGEO believes that the experience gained with the Arroyo Crossing project will open more doors for developers to redevelop geotechnically complex, environmentally-impacted and underutilized property with confidence. This project in particular exemplifies ENGEO’s ability to develop resourceful, long-lasting alternatives for site mitigation and construction preparation.